The combination of chilli and chocolate might not appeal to everyone, but when you get it just right, the two ingredients work perfectly together. 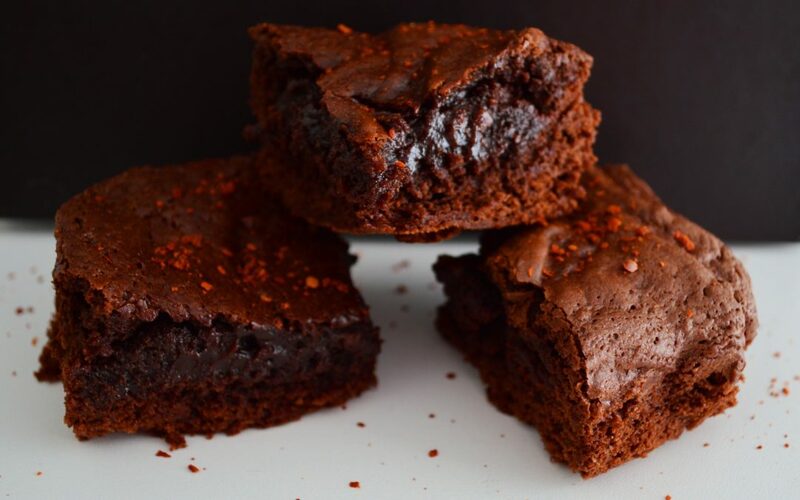 These dark, gooey chocolate brownies have just a hint of fiery warmth from Chilli Pepper Pete’s Ancho Chillies, which combined with a little cinnamon brings out the glorious richness of the chocolate. Try them for yourself and see. 1. Start by weighing out the margarine in a microwaveable bowl, and adding the chocolate, broken up into pieces. Microwave in thirty second bursts, stirring each time, until completely melted and smoothly combined. Set aside. 2. In a large mixing bowl, weigh out the caster sugar, then add the three eggs and whisk until pale and frothy. Pour in the chocolate and mix gently. 3. Add the flour and cocoa to the bowl and fold into the wet ingredients. Cover the bowl and set aside for half an hour. 4. Meanwhile, you need to rehydrate the Chilli Pepper Pete’s Ancho Chilli. Chop it into a couple of pieces, pop into a bowl, and add enough hot water to cover. Leave it to soak for about ten minutes, then either blend it or chop it very finely – enough to turn it into a thick paste. At this point, you can probably start preheating the oven, to 180˚C (170˚C fan). 5. After half an hour, the chocolate mixture should have thickened up a little bit. Mix through the prepared Chilli Pepper Pete’s Ancho Chilli and a teaspoonful of cinnamon, then transfer to a square brownie tin lined with greaseproof paper. Place in the oven for 30 minutes, until the mixture is just set and looks shiny on top. 6. Sprinkle the warm brownies with Chilli Pepper Pete’s Aleppo Chilli Flakes (optional) and then allow the brownies to cool in the tin for half an hour, before cutting into squares.